How are you all doing? I am doing great! Just enjoying the beautiful weather and my break. Notice anything different from my look? I got a perm and hair cut. I got tired of the puffy hair...lol. I normally do not have my hair out I mostly have it in a weave; but this past couple of months I have left it out and I kinda like it. On to my outfit, I am still trying out spring/summer trends. Today's outfit post is all about neon and color-blocking. 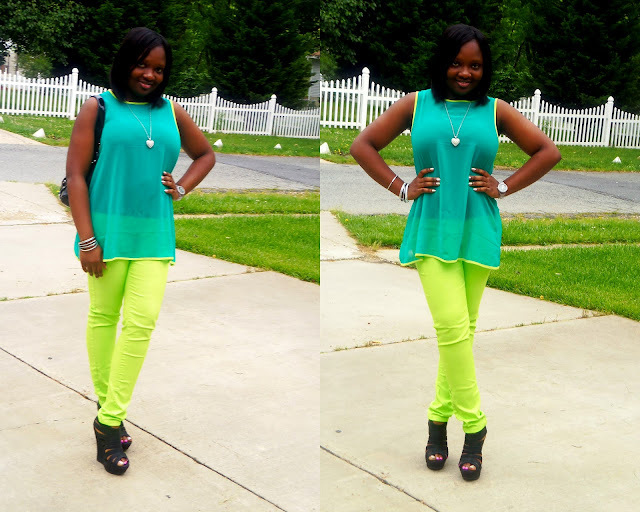 I paired this Neon Green jeans with a Sleeveless Turquoise reverse high-low tank top. I completed the look with some black and silver accessories. I love the neon trim details and buttons of top, and the reverse high-low is just so cool. Hope you guys like my outfit. Thanks for stopping by and a wonderful day! Pictures taken by my brother, Rilwan. GOSH! these colors make me wanna go CRAZY! Thanks! I am glad you like the colors. Thanks! Sure we can follow each other. I will follow you now.